Cute, well-dressed kids. Dont we all want them? Throw in good manners and its enough to make a mother swoon. Here at Momtrends we dont promise to deliver pleases and and thank yous, but we can deliver the fashions. Were partnering with CWDkids (now you know what the acronym stands for!) to share some favorite looks for fall. These are the clothes youll want to have in the closet on picture day, and the clothes the kids will want to romp around in. Its a brand everyone can be happy with...even finicky grandparents. For Girls: Striped Dress with Scarf ($39.50). Effortlessly chic isnt it? This dress has modern striped and is cut for comfort. The girl in your life will love the trendy neck--this is a winner. Pair it with the shiny riding boots ($44) and this outfit is bound to be an instant favorite. For a more equestrian feel, Im smitten with this Horse Print Top. Its a mother/daughter duo--I can get my size and the girls can coordinate. 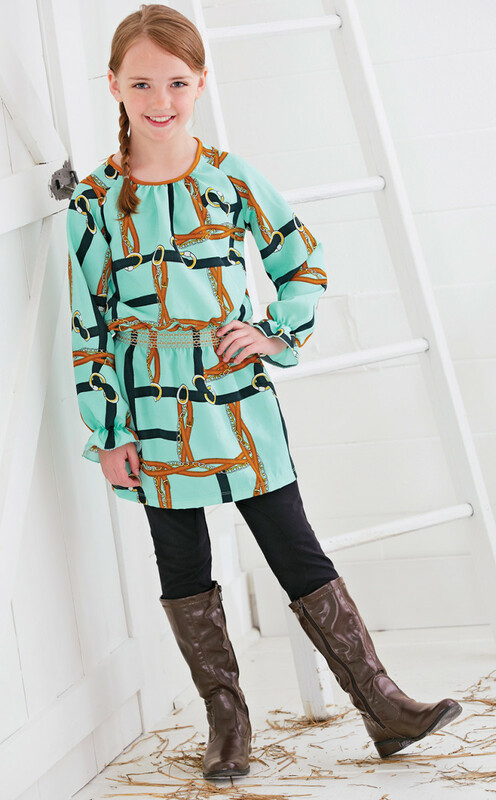 The little Horse Bridle Tunic top ($29.50) comes in sizes 2-18. For moms, the tunic ($44) comes up to size 14. Perfect for those special fall outings youve got planned. And youll really want those boots I mentioned--they seem to go with everything this fall. For my littlest girl, age 5, I know this Horse Double Layer Dress ($56) is going to be a hit. Shes dedicated to riding. Every Saturday we head to the stable to see Dino. But shes also a girlie girl. During the week I can fuel her horse-fanaticism with this flirty, twirly dress. The accessories make this outfit super fun for girls. Add the sparkly headband and tights and you know your little pony-lover is going to be happy. CWDkids has more fall fashion than I can cover in this post. Head to www.cwdkids.com/ to see the full collection. This is a sponsored post. The client hired us to curate a few of our favorite fashion finds from the fall collection. All opinions are those of Momtrends.